While your wood fence may be durable, you might notice a gradual lean in your fence over time. Your wood fence is a great investment for your home for many reasons. Not only does it enhance the overall look of your landscape, but it also provides protection as a boundary for pets and children playing in your yard. While your wood fence may be durable, you might notice a gradual lean in your fence over time. Although this issue can easily be fixed, it is important to recognize its potential causes so that this problem can be repaired and prevented in the future. If you are currently noticing this issue around your property, consider these three potential causes for a leaning wood fence. If your fence posts are not deep enough in the ground, your could potentially lean and fall over. Because your fence posts serve as the foundation for a structurally sound fence, it is important to ensure that they are deep enough in the ground. This will ensure that your fence will withstand high winds, storms, and excessive rain and will prevent leaning in the future. Although a fence may seem like it is in an otherwise good condition, the condition of its posts is just as crucial to its ability to stand tall. For this reason, it is essential to check the health of the posts beneath your wood fence. A rotten post caused by mold, a break in the wood, or excessive moisture could lead to your fence leaning over time. As a natural material, wood can be prone to warping over time due to inclement weather, humidity and changing temperatures. Following storms and rainy seasons, wood can change shape as it slowly absorbs moisture. This process of swelling and drying ultimately causes it to shrink. As a result, your panels may even crack or warp before eventually leaning. 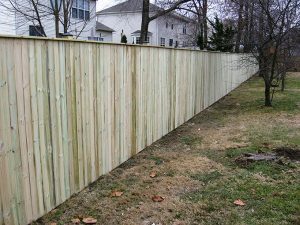 Installing a fence with the right panels and support posts can prevent excessive stress on your wood fence. Enjoy Fall Entertaining in Your Beautiful Yard!